Following World War II, the Japanese who had been living in its then colonies returned to Japan where many houses had been lost during the war. In addition, as the country began to show rapid economic growth and industrialization in around 1955, a massive population began flooding into large cities in search of work. This created serious problems of overcrowding and lack of privacy as people were obliged to live in small dwellings together with large families. From the point of view of urban planning, suburban sprawl could not be left uncontrolled either. The Osaka Prefectural Government decided on a policy to construct over one million dwelling units. As part of the priority measures, it launched the Senri New Town project on the Senri Hills in the northern part of the prefecture, in order to create a good living environment through the provision of a large number of low cost quality dwellings and housing sites. This was the first large-scale new town project in Japan. Following a preparatory study beginning in about 1956, implementation of this project was approved in 1958. The master plan, initially based on 2,500 hectares, was revised to 1,160 hectares for the final plan in 1960, in accordance with the prefectural finances. 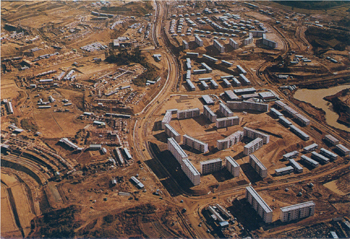 The construction began in 1961 and the first residents moved into the Satakedai unit in 1962. Meanwhile, legislation concerning the development of new towns was introduced. Posted by 千里ニュータウンまちびらき50年 at 13:24 │What is Senri New Town?